Sir Cliff Richard has won the latest round in the battle of the Christmas gift charts - with his mug outselling One Direction. The boyband had toppled the pop veteran in the celebrity calendar sales - knocking him off the number one spot for the first time in 13 years. But now The Sun has revealed a Cliff cup launched just two weeks ago has sold 2,000 units, while the One Direction equivalent has shifted just 250. 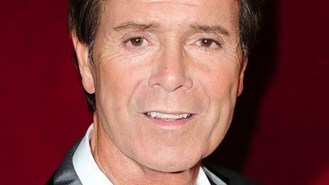 So Sir Cliff, 73, is outselling 1D by eight to one on the mug front. The Dalek's are at number three, Pac Man is number four in the mug charts and Darth Vader is the fifth most popular celebrity mug. Reunited pop acts who starred in hit series The Big Reunion are to battle The X Factor winner for the Christmas number one - to raise cash for an ITV charity campaign. Katy Perry has told how she found strength from writing a song about her split from Russell Brand. The Jonas Brothers have asked fans to "bear with us" amid growing speculation that they have split up. Keane have denied reports they are planning to split up. Robbie Williams is to perform with Miss Piggy and Kermit when he launches his new swing album with a one-off show at the London Palladium. Singer Noel Harrison, known to millions for The Windmills Of Your Mind, has died at the age of 79. Mary J Blige will sing the US national anthem before Game One of the World Series.